Joan Miro, ‟Woman listening to music”, 1945, photo© Successió Miró / Artists Rights Society. Collectors of works of art will have a field day. The art collection belonging to the late Preston Robert Tisch and his also deceased wife Joan Tisch will be auctioned at Christie’s House this coming May. The collection’s value is estimated at 80 million dollars. 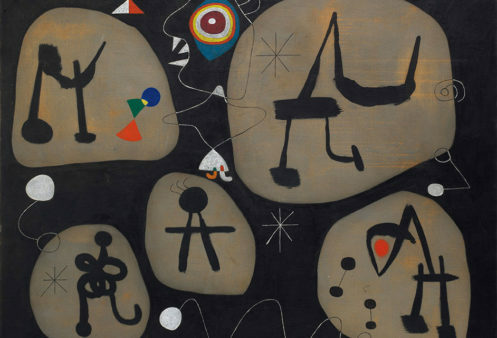 The 40 works include paintings by Picasso, Miro, de Kooning, Alberto Giacometti, Leger and others. Joan Miro’s painting ‟Woman listening to music”- a work of 1945-is expected to be sold for as much as 15 million dollars, while a work by Willem de Kooning has been valued at 12 million dollars. The auction will take place as part of Christie’s sale of Modern, Post War and Contemporary Art and the proceeds will go towards the Tisch family foundations.